BSNL launched it's Free WiFi broadband internet services in Kochi as a part of Digital India Celebrations. BSNL in association with Quadgen Wireless Solutions and Kochi Corporation, has launched 24 x 7 WiFi service in ten major locations in the city. With this, Kochi has become the first city in the country which provides maximum WiFi coverage. The locations include - Kochi Corporation office, Subhash Park, Marine Drive, District Court Complex, Durbar Hall Road, High Court, Kaloor Bus Stand, Edappally Junction, Mattancherry and Fort Kochi. 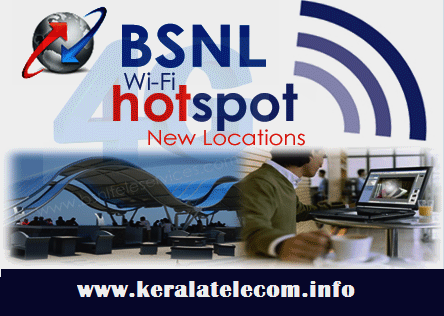 Customers of any mobile company can access BSNL's Free WiFi Services in these locations. BSNL provides a bandwidth of 2 Mbps to 20 Mbps in these WiFi locations within a radius of 300 metres. The facility will be available free of cost for the first 30 minutes in a day for a maximum of three occasions in a month for the same mobile number. Apart from this, the customers will have to pay a fixed tariff rate for using the WiFi and it can be available through physical recharge coupons or through online recharge method. How to access BSNL WiFi (QFI) Services? A Rs 30 coupon has to be used for using 30 minutes. For Rs 50 recharge, one can use the facility for one hour. For two hours, the cost is Rs 90 and for the whole day the amount will go up to Rs 150. The official inauguration of the project was conducted by Prime Minister Narendra Modi during the Digital India inauguration ceremony at New Delhi last Wednesday. As part of Digital India Week celebrations, BSNL is also conducting a photography / video contest for the public. Dear readers, please share your views and opinions about the newly launched WiFi Services by BSNL via comments with us. Where exactly in fort kochi?